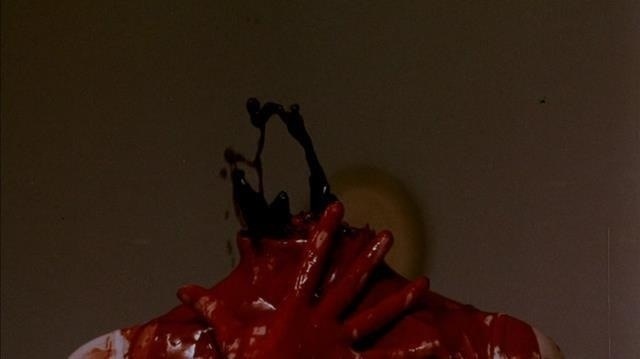 Released in 1981 Nightmare, which also goes under the title Nightmare in a Damaged Brain and Blood Splash, built up a large cult following despite being OOP for a very long time until 2011 when after many delays was finally released on DVD by Code Red, which quickly went OOP. 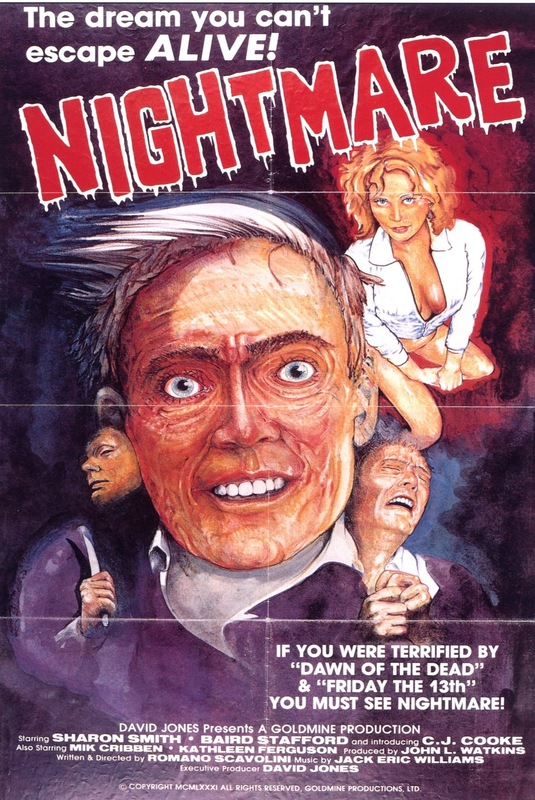 Nightmare is often described as one of the sleazier exploitation films of the 80s and one of the most graphic. While the film has plenty of violence it isn’t as graphic as its reputation and as far as the sleaze goes it really wasn’t all that much with the exception of the peep show scene in which a woman pleasures herself. Though depending on which version you watch on the Code Red DVD you may not see that much (more on that later). 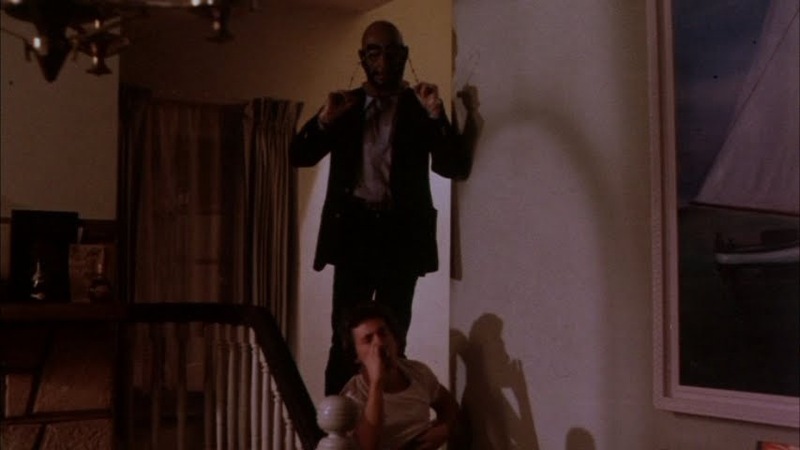 Nightmare does have that grimy exploitation feel and while I wouldn’t really label the film sleazy I can see why some would. Now don’t take any of this wrong as there is plenty of gore on display and they look great and were done by Ed French and the film does have a bit of a sleazy feel though most of that is in the early part of the film and once George Tatum (Stafford) leaves New York the more sleazy feel sort of leaves as well. 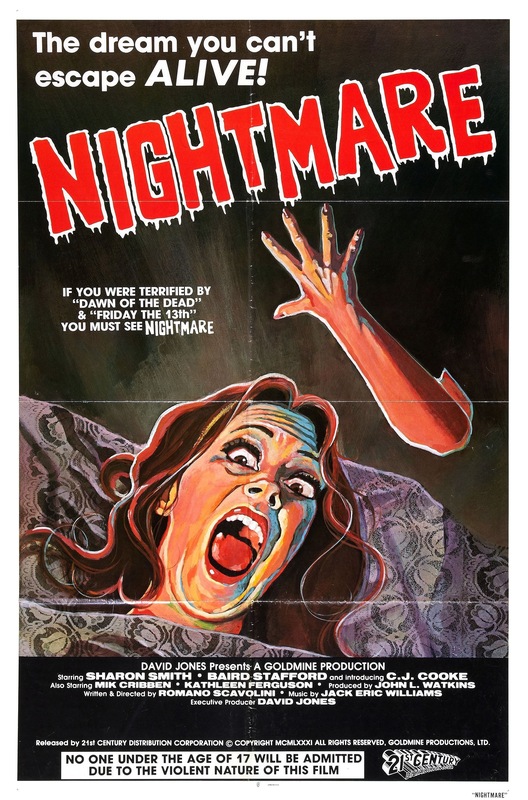 Nightmare is sort of a miserable film and I don’t mean that in terms of quality; Nightmare just has this ugly feel to it and really none of the characters are very likable. George despite being the villain is in someways sympathetic as he wants to stop killing, but can’t. The family he stalks also aren’t very likable. Of the 3 kids only C.J. (Cooke) plays a big part and the kid is a brat and a psychopath in the making and often tortures his babysitter and even though he’s only a child its still difficult to feel any sympathy towards him. The mother Susan (Smith) is also kind of miserable and while its not easy being a single mother of 3 children she seems totally unfit. The family very much has that trailer trash vibe going. The lack of likable characters can sometimes sink a horror film unless its a splatter flick, but in some ways it adds to the tone of the film as we’re stuck in a miserable world with miserable people. Some of the problems is ok so George is given an experimental drug and released. Ok fine I’ll accept it, but his doctor is unaware that George’s dreams are actually a murder he committed as a child. Later in the film another doctor mentions how the dream was real and its in his police records. So why is it George’s doctor never even saw these records? This aspect is a little absurd to me and while it doesn’t really hurt the film for me it is a bit silly. 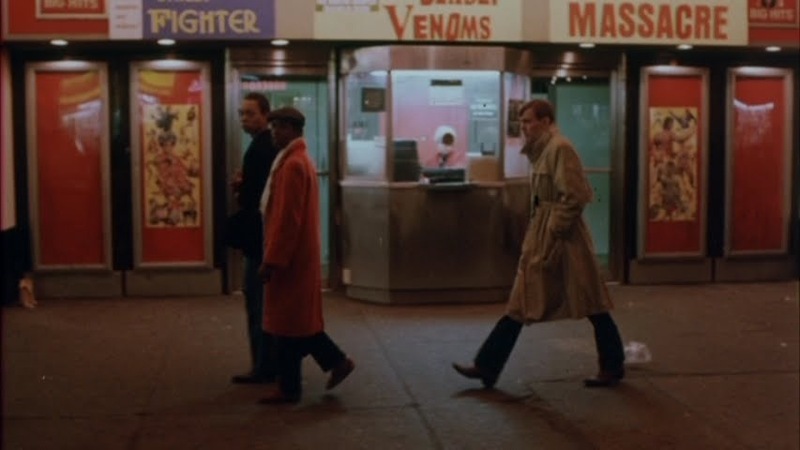 The screenplay by Romano Scavolini does make for an interesting character study and is probably better written than most exploitation films. However the script also has some problems like mentioned how George’s doctor is oblivious to his dreams being based on a past crime. Also characters are a little weak and we never really get to know much about them. We never really get much into the mind of George and what made him snap. Though again despite the flaws its better written than the bulk of exploitation films. As director Romano Scavolini crafts a film with a bleak and miserable tone. Early on as I mentioned the tone has a sleazy feel, but moves away from that once we get to Florida. Pacing can be a little sluggish in spots and at 97-minutes Nightmare may have benefited from a little bit of editing. There are some nasty death scenes and while not as gory as its reputation, for the most part they are still effective. The final act plays out more in tune of a slasher film and these scenes are also effective only hindered by un-sympathetic characters. 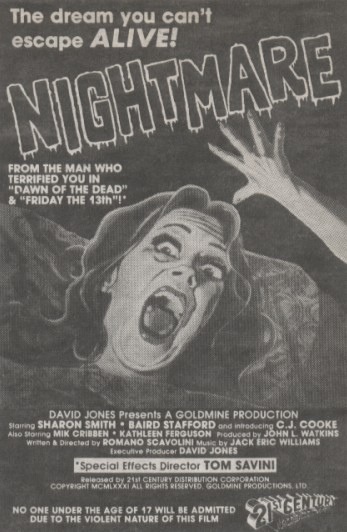 Overall Nightmare is a solid film with an excellent performance by Baird Stafford. Like I said its not as sleazy or gory as its reputation, but it still has a good amount of both. 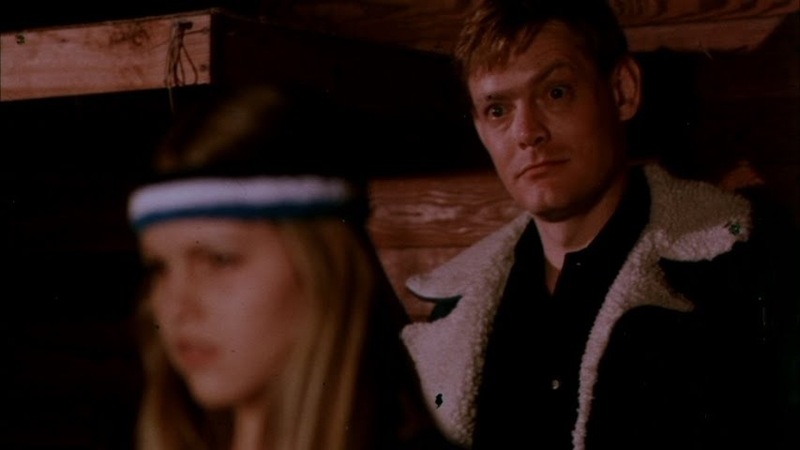 While not a great film Nightmare is still a nice little exploitation film made at the time when these films were fading for the slasher film. Danny Ronan who played Kathy would later go onto a career in the Marines and after retiring would become a school teacher. The DVD from Code Red is uncut and comes with three different transfers; disc 1 has a 2008 Hi-Def Master from two of the best 35MM prints plus a full frame color corrected telecline transfer approved by the director. The 2nd disc is a 2011 telecline transfer from a recently discovered slightly better 35MM print. Of the three the full frame print was the weakest as it has more of a VHS quality. The 2008 transfer is solid and while it displays plenty of print damage its still a solid enough transfer. The 2011 is very similar to the 08 also filled with print damage, but the 2011 transfer shows a little more information such as the peep show scene. You can’t go wrong with either the 08 or 2011 transfer, but I prefer the 2011 for the extra information that is visible and very slightly better print.